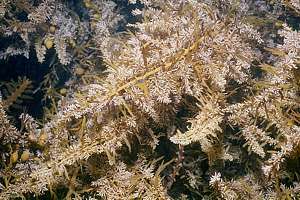 The brown seaweeds are tough and able to live in wave-exposed waters near the surface. 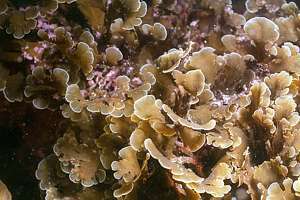 They are the most common seaweeds of the intertidal rocky shore, usually found in and below the sublitoral fringe. 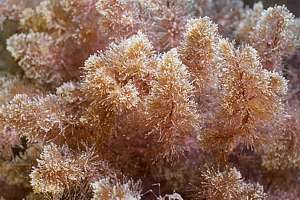 All the big and strong seaweeds in New Zealand, and perhaps in the world, consist of brown seaweeds. They are able to live close to the surface, in bright light with a high dose of ultraviolet. The stringy bladderweeds are tough, flexible and streamlined, and they can survive strong to extreme wave action. f210515: the bull kelp (Durvillea antarctica) has a single round stipe sprouting from a large round holdfast. The fronds branch out to whip-like leaves that float on the water. Inside these leaves the plant has a honey-comb structure. 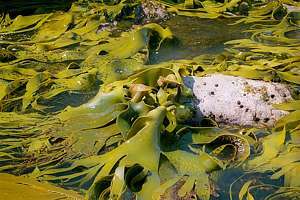 In sheltered waters, the leaves are not whip-like but more flat and also floating. f210223: bull kelp (Durvillea antarctica) in wild water makes whip-like fronds that yield to the water movement while floating on the surface. This is a good strategy to minimise wave stress. These leaves can grow to 10m in length. The hollow leaves have been used by early Maori to store and preserve muttonbird (a shearwater). 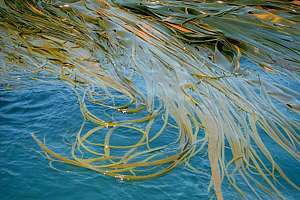 the giant bladderkelp (Macrocystis pyrifera) has narrow but extremely tough stems from which branch float bladders with a long narrow leaf attached. 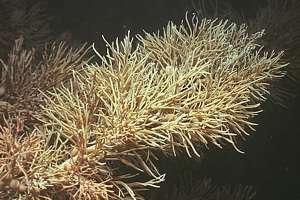 Its holdfast can grow multiple stems, which can grow to 30m long, depending on the light conditions at the bottom. Swimming through a forest of these 15-20m tall, strictly parallel 'trees' is an awesome experience. 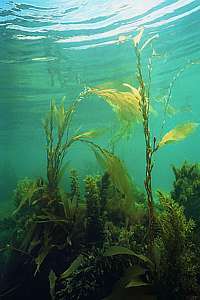 Unfortunately, because seas are becoming murkier, the giant kelp can no longer establish itself in deep water. In shallow water it can grow only where the pebbly bottom it prefers, is not stirred, and there must also be enough light for its spores to develop. f027104: the giant kelp (Macrocystis pyrifera) in shallow water, beginning to tower over all other seaweeds. 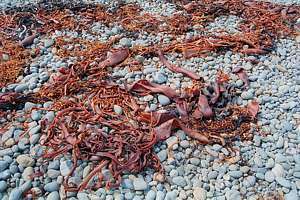 f980326: bullkelp is washed up on the beach because it floats. Here it dries up to tough hard masses that decompose only very slowly. 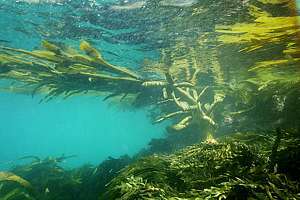 Ancient Maori used the bullkelp as a bag for storing food in. f026724: below the floating bullkelp Durvillea antarctica grows a young branched Durvillea Willana on a very strongly attached holdfast. From the intertidal, looking down into the sea, one can hardly imagine how massive this seaweed becomes. 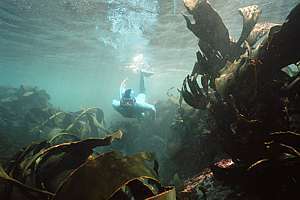 f026435: a diver visits a forest of branching bullkelp (Durvillea willana) whose leaves can grow to a colossal size, one metre wide by five metres long and very thick as well. When these flap around, one must be careful not to get hit. f051711: the necklace weed (Hormosira banksii) or Neptune's necklace can store much water in its bladders, which protects it against drying out. It prefers calm conditions and is usually found inside harbours and on the fringe of rockpools. 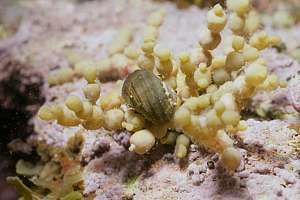 In sheltered waters its beads are large; in exposed sites small. f034931: the wiry weed (Carpophyllum angustifolium) has a thin but very strong stem and small leaves. 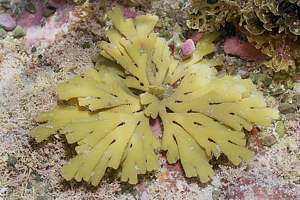 It survives in the wildest of waters, near the surface of highly exposed reefs where no other seaweeds can grow. Its thin stems are so strong that a man has great problems breaking them. Divers sometimes call it Number Eight wire. f051700: the broccoli weed or cartilageous weed (Xiphophora chondrophylla) has flat stems that branch in a flat plane but at the extremities it forms a broccoli-like head. 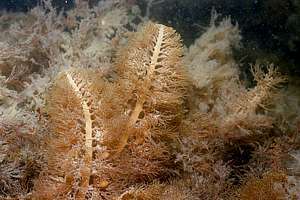 The thick stems are strong and store much water, which allows it to grow at the low tide in moderate exposure. f051703: a broccoli weed (Xiphophora chondrophylla) begins life by spreading itself in a horizontal plane. The broccoli weed feels a bit like cartilage (Greek: chondros). f051111: the flapjack (Carpophyllum maschalocarpum) has flat stems that branch in a flat plane with pointed leaves and large pointed float bladders. Its strength rates in between the strong wiry weed and the featherweed. It tolerates short exposure to sun and air and prefers to live in sheltered to moderately exposed conditions. f050217: the feather weed (Carpophyllum flexuosum) is not very strong and prefers to live in moderate exposure where it is not prone to drying out. It has a flat stem and finely branched leaves and small float bladders. 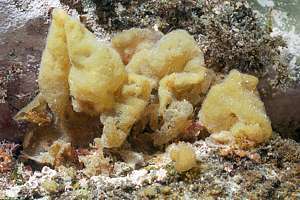 It is believed that it has several growth forms, but these may well be separate species. found on E side of N Island. Xiphophora gladiata, the slender cartilage weed grows much like X. chondrophylla at low tide level, and is tough. 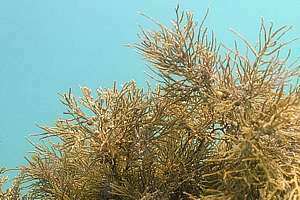 Its branches are thick and flat and with y-shaped ends. 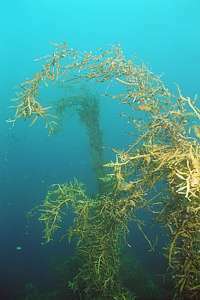 Sargassum sinclairii, the sargasso weed has a fine structure with undulating leaves and small float bladders. It is pretty. Marginariella boryana has long strap-like blades splitting from a domed holdast consisting of fibrous branchlets. 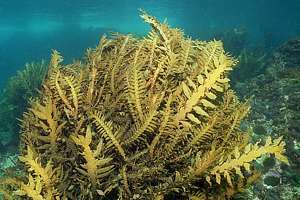 Reproductive fronds have long yellow or brown vesicles hanging off in a row. Mainly from Wellington south. 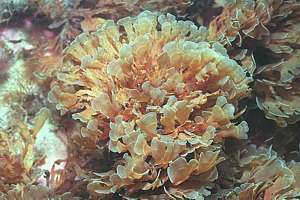 Undaria pinnafitida is an invasive species from Japan where it is called Wakame. It is pen shaped with a large midrib and slimy blade. A frilled sporophyll is found at the base of adult plants. Manily from Wellington south. Endarachme binhamiae (20cm) leaf-like flat thin blades clustered from a common base. Petalonia fascia (15cm) a cluster of small slimy light brown blades originating from a crust base. 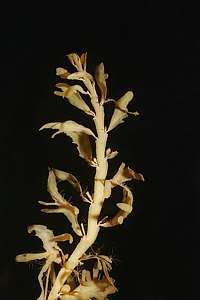 Scytosiphon lomentaria (10-30cm) a brown slim seaweed forming sausage-like chains. Sausages can be tubular or flattened. Seasonal in winter-spring in upper intertidal. slippery. Mainly on the South Island. 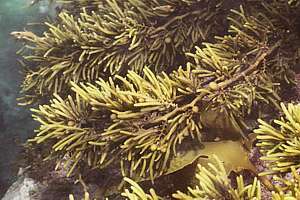 Adenocystis utricularis (2-9cm) a brown seaweed with water-filled bladders, firm and swollen, originating from a small round holdfast. Found on open coasts in the lower mid-tidal. 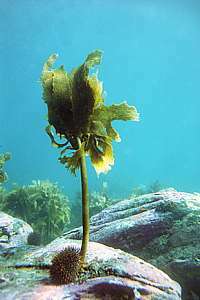 f006828: the stalked kelp (Ecklonia radiata) stands erect by the stiffness of its stalk, rather than by float bladders. Its large crown makes it susceptible to being pulled off the rocks by waves, so it prefers the calm of the deep. Here a sea urchin is considering to clear-fell it, as it is standing inside the urchin barren zone. f048401: the flexible weed (Carpophyllum flexuosum) has an almost straight flat stem and long leaves with a mid-rib and smooth edges. It is not strong and prefers calm conditions. The flexible weed is particularly successful inside harbours, as it is able to shed deposition by sloughing it off. f048306: in sheltered conditions the flexible weed (Carpophyllum flexuosum) can grow over 6 m tall, at times forming veritable forests, but such forests can disappear overnight by a large storm. f042030: the zigzag sausage weed (Cystophora torulosa) has a round stem that zig-zags in between each side branch. Its leaves look like sausages. It has small float bladders. f032335: the pillow weed (Colpomenia sinuosa) is hollow inside but not able to retain water. 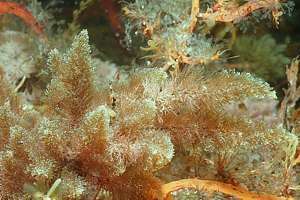 It is found in stable rock pools and can grow on other seaweeds. slender zigzag weed (Cystophora retroflexa) looks a bit like featherweed but has a zigzag stipe. East coast North Island. ladderweed (Cystophora scalaris) is easily recognised by its zigzag stepped stipe and thin leaves. sea bombs (Adenocystis utricularis) are 5cm club-like green-brown glands sprouting from a single point. Leathesia difformis (2-10cm) a slimy hollow thin-walled blob looking like yellow cauliflower with holes in it. Found in degraded habitats. Leathesia intermedia (10mm) a similarly looking seaweed but much smaller than L difformis, found mainly on seaweeds. Colpomenia peregrine (6cm) is globular with smooth, thin walls, greenish yellow and feels thin and papery. Colpomenia sinuosa (10cm or more) is a smooth blob with thick walls, golden to greenish brown and feels firm. f042208: a branch of slender zigzag weed (Cystophora retroflexa) , often confused with featherweed. f051931: slender zigzag weed. f050308: ? f042218: brown halo weed (Halopteris sp.) has light coloured tips, resembling a halo. It is small (20cm) and finely branched. there are eight species of Halopteris in NZ. f051713: Zonaria angustata? 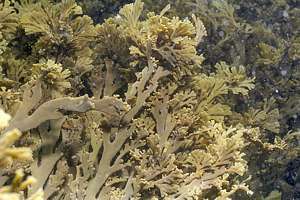 a small-leafed brown seaweed which stays small. It has a white margin and makes a zoned appearance. f042212: Zonaria sp. 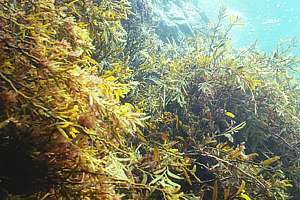 0608240: thin threads of the filamentous brown seaweed Bachelotia fulvescens?. f051637: halo weed (Halopteris sp) has a light coloured halo over the tips of its leaves. It can be purple with yellow halos. Dictyota spp (up to 15cm) small, fan shaped dichotomously branching (splitting) with rounded ends. Tiny fan-shaped blades on rocks. Sporadic. Laethisia difformis, a light brown bubbly crust, found on a low level in spring and summer. 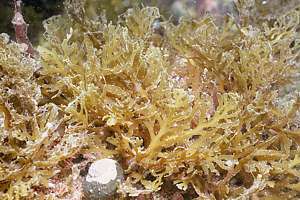 Splachnidium rugosum, (20cm) the gummy weed is found in the middle shore has thick greenish swollen fingers filled with firm thick slime that branch from a main finger. Tinocladia novae-zelandiae has irregularly branched thin cylindrical stipes. Dark brown with small hairs and a slippery texture. Its holdfast is a small disc. Looks like Mesogloea intestinalis. 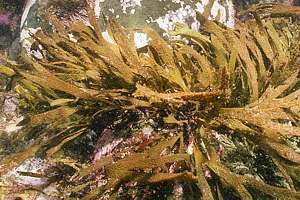 Scytothamnus australis, (10-30cm) a thin brown seaweed with whiplike leaves, branching irregularly. Will turn black when drying out. Firm bushes on higher shore rock. 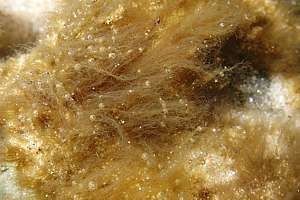 Ralfsia verrucosa is a golden brown wrinkled crust with a firm and leathery texture.